Beauty comes in many forms. The beauty of braids transcends culture, ethnicity and race while representing a particular era, social economic level or origin. Braid patterns or hairstyles indicate a person’s community, age, marital status, wealth, power, social position, and religion. Elaborate patterns denote special occasions like weddings or social ceremonies. Braids communicate such loud statements reflecting love or admiration of culture, activism or fashion boldness. Traditionally in the US, beauty is perceived and welcomed in the form of straight hair devoid of texture. Globally, beauty encompasses many attributes including texture by way of braids, twist, Locs and curls. Untraditionally, the aesthetic of beauty is rapidly evolving to include world beauty. Main stream media, photographers, models and actresses clamor towards bolder, beautiful looks that reflect a new global appeal rich in culture and heritage. We’ve all seen Lupita Nylongo notably one of today’s most recognizable faces change the look of beauty. Her striking African features and impeccable sense of style command attention whether in her natural Afro or her newest glam style of Cornrows. When you think of an Indian, you usually imagine them wearing braids. This hair style was often the traditional style among Native American Indians. What most people don’t know is that certain tribes had their own traditions when it came to hair. In the Quapaw Tribe, women who were married wore their hair down loose while single women wore their hair in braids. Often they would roll these braids in coils and fasten them behind each ear. These coiled braids would then be decorated to attract a mate. In the Blackfoot Nation Tribe men were the ones in braids. Men wore three braids often with a topknot or pompadour. Women word their hair loose or occasionally wore two thicker braids down the front. Plains Indian men wore the traditional two long braids often seen in movies. Meanwhile the women of the Plains Indian tribe cut their hair shorter than the men’s hair. French braids are popular the world over, but they certainly aren’t emblematic of France. As it turns out, “French” braids aren’t French at all. So who’s really responsible for the technique? The style’s history is much cooler (and longer) than you might imagine. If we’re looking for the origins of modern-day French braids, the place to start is North Africa. People have been wearing the three-strand gathered plait for thousands of years, and the earliest evidence of the style comes to us from the Tassili n’Ajjer mountain range in Algeria. There, rock art depicting women wearing rowed braids dates back almost 6,000 years. In the millenia following, the style also appeared in early Greek art, particularly iconic kouros statues, on Celtic warriors and lasses, and as part of the elaborate updos worn by courtly women of the Sung Dynasty. Surprisingly, there are very few cultures unaware of French braids, making their unusual moniker even more puzzling. How could something so universal be named after a single country? Wisely, the French themselves don’t even claim the style as their own. So why are Americans so confused? We can trace the origins of this particular misnomer back to an 1871 short story from Arthur’s Home Magazine in which a rather misogynistic husband tells his wife to “hurry up and put on that new cashmere I sent you, and do up your hair in that new French braid.” Perhaps because France has always been so immediately connected to fashion and high living to people on this side of the Atlantic, any “fancy” braid would have registered as Continental. In short, although you can feel free to keep calling it a French braid, the hairstyle is actually one of humanity’s oldest and most popular hair inventions, just as much in use now as it was in ancient Sparta. They aren’t from Paris, but whatever you call them, gathered braids are unquestionably as timeless and chic as the City of Lights. Cornrows, also known as rows, braids, or canerows in the Caribbean, are a traditional African style of hair grooming where the hair is braided very close to the scalp, using an underhand, upward motion to produce a continuous, raised row. Cornrows are often formed, as the name implies, in simple, straight lines, but they can also be formed in complicated geometric or curvilinear designs. Often favored for their easy maintenance, rows can be left in for weeks at a time if maintained through careful washing of the hair and regular oiling of the scalp. Cornrowed hairstyles are sometimes adorned with beads or cowry shells. Depending on the region of the world, Cornrows are typically worn by either men, women, or both. A traditional way of styling hair throughout North Africa, East Africa, and West Asia, depictions of women with Cornrows have been found in Stone Age paintings in the Tassili Plateau of the Sahara that have been dated as far back as 3000 B.C. This tradition of female styling in cornrows has remained popular throughout Africa, particularly in North, East, and West Africa. Historically, male styling with cornrows can be traced as far back as the early nineteenth century to Ethiopia, where warriors and kings such as Tewodros II and Yohannes IV were depicted wearing Cornrows. Outside of Africa and Asia, Cornrows have also been worn and depicted in Europe, particularly in Greek and Roman art, and may have had a similar presence in Celtic culture. Everything in the Indian culture happens on a grand scale. Take for example the big fat Indian wedding. Be it any region of the country – a wedding without music, dance and great food is considered a boring affair. Equally important is the wedding look for the bride and groom. The groom could get away easily with an impressive outfit. But the bride has a lot more to think about. Beyond her wedding dress, the bride has got to get her jewelry, make-up and hairdo right. When it comes to bridal wear, the lehenga and saree share the popularity. However, when we consider traditions and cultures across the country, the elegant saree takes centre stage. The variety in saree draping itself is a strong reason to choose the embellished 6-yard fabric for your wedding day attire. For jewelry, antique designs are often favored. There are brides who take the minimalistic approach too, but compensate for glamour with their make-up and hairdo. Minimalistic or elaborate, bridal hairstyles need to be well planned and executed. For those brides who take a dupatta or saree pallu over their head, a neat updo is often preferred, so that their hair does not come in the way. For the South Indian bride, a thick long braid and a head full of flowers is the usual do. Maang tikkas, hair combs and decorative pins are also used for accessorizing. The long braid has been a bridal staple for generations – both in the north as well as south. Probably because it is one bridal hairstyle that can be easily managed and decorated. There are several options in embellishing the braided hairstyle for sarees. You can either use flowers or hair accessories like Jada and hair pins. Traditionally, the 3-strand braid is the usual hairstyle for sarees. But now we can also try the fishtail side braids, rope braids or French braids with sarees. Braided updo’s are also popular these days. You can also try a twofer hairdo with a bun at the base of your head and a long thick braid with the help of hair extensions. Multiple braids with intricate embellishments were extremely common in ancient Egypt. Much like the “Cleopatra” look seen above, wealthy women were often seen with beautiful, beaded braids that, at times, had added extensions. Although ancient Egyptians had an aversion to body hair, head hair and beards were the exception. Since beards were seen as a symbol of divinity, it is no surprise that braids made an appearance on the faces of men as well. The “common” people wore simpler braids for practical purposes (keeping their hair out of their face while working.) Much like Africans, ancient Egyptians braided styles gave clues to the nature of the person – whether they were royal or common, Egyptian or foreign, etc. During the Flavian period (79-81 CE), the daughter of Roman Emperor Titus, Julia, created lavish up-dos consisting of wire frames, twisted braids and curls. These elaborate hairstyles eventually became popular amongst wealthy Roman women and became even more dramatic in later Roman periods. The more elaborate the style, the more it indicated a woman’s wealth and available leisure time. In 1960’s and 1970’s America, a much-needed Black is Beautiful movement took place, empowering African-Americans and encouraging them to embrace their cultural roots and natural beauty. Rather than using chemical straighteners and relaxers, it was more popular during this time to wear natural Afros and Cornrows like those in Africa so many centuries ago. Zig-zag braids, classic Cornrows and Micro Braids became popular hairstyles and continue to be to this day. When YouTube launched in 2005, braiding became an internet sensation. There are currently over one million braiding videos on YouTube for literally endless inspiration. Many of the braids worn by modern ladies like yourself take root in many places from people of many times past. In closing, hairstyles come and go but braided hair is an ancient beauty technique with a long and literally winding history that roams across countries, cultures and centuries. Braids have made appearances on the heads of men and women throughout history, indicating everything from utility to glamor, social status to ethnicity, marital status to even religious affiliation. In modern times, hairstyles aren’t quite so serious but one thing hasn’t changed: braids are cool. A quick internet search for braided hair will return millions of results and with no doubt incorporate global beauty. 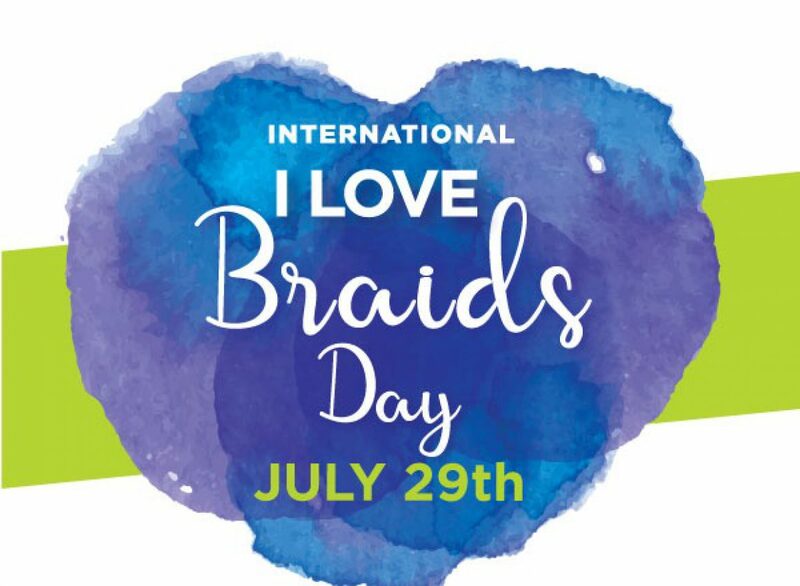 Previous Which Logo Best Represents International I Love Braids Day?